As President Donald Trump heads to El Paso, Texas, on Monday for his first campaign rally of the year, some local officials and law enforcement are speaking out against his recent claims on border security. There are concerns that the president, holding a rally in a 6,000-seat arena on Monday night, will share what some officials call a misguided view on the effectiveness of a border fence in El Paso. During his State of the Union address last week, Trump claimed El Paso has become one of the safest cities in America because of a barrier fence, igniting a firestorm of reactions from state and local representatives. "The border city of El Paso, Texas, used to have extremely high rates of violent crime -- one of the highest in the country, and considered one of our nation's most dangerous cities," Trump said. "Now, with a powerful barrier in place, El Paso is one of our safest cities." 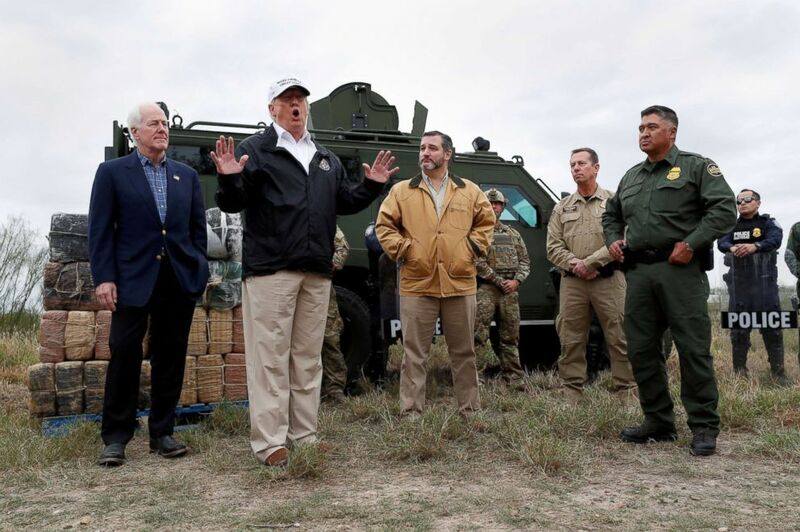 President Donald Trump speaks to reporters along the banks of the Rio Grande River during a visit to the U.S.-Mexico border with Sen. John Cornyn, Sen. Ted Cruz and U.S. Customs and Border Patrol agents, Jan. 10, 2019, in Mission, Texas. Hours later, the El Paso County sheriff denounced the president's remarks. "It is sad to hear President Trump state falsehoods about El Paso, Texas, in an attempt to justify the building of a 2,000-mile wall," Sheriff Richard Wiles told ABC News. "While it is true that El Paso is one of the safest cities in the nation, it has never been considered one of our nation's most dangerous cities. And El Paso was a safe city long before any wall was built." El Paso Mayor Dee Margo slammed the president on Twitter: "El Paso was NEVER one of the MOST dangerous cities in the US. We've had a fence for 10 years and it has impacted illegal immigration and curbed criminal activity. It is NOT the sole deterrent. Law enforcement in our community continues to keep us safe." The city’s fence was part of many barriers built under the Secure Fence Act, a bill signed by President George W. Bush in 2006. The legislation, supported by many Democratic members of Congress funded hundreds of miles of fences along the southern border. Former U.S. Rep. Beto O’Rourke, whose hometown is El Paso, also engaged in the debate, calling the 2006 legislation "misguided." "Our government built a border fence in El Paso in 2008, a misguided response to 9/11 (no terrorists have crossed the southern border and attacked this country). It didn't make us any safer," O'Rourke said in a tweet. On Monday, when the president takes the stage in El Paso, O'Rourke will do the same a stone's throw away. Trump's rally will take place at the larger El Paso County Coliseum, while O'Rourke will speak at the Chalio Acosta Sports Center. The O'Rourke rally, according to organizers, will "show the country the reality of the border -- a vibrant, safe, bi-national community that proudly celebrates its culture, history, diversity and status as a city of immigrants." Trump campaign officials say the city was chosen for the rally to show the effectiveness of the border fence. "As the president continues his fight to secure our border, there's no better place to demonstrate that walls work than in El Paso," Michael Glassner, the Trump campaign's chief operating officer said. The El Paso Times reported that violent crime rates in the city increased 17 percent between 2006 to 2011, even with construction of the border fence beginning in 2008. The city had the third-lowest violent crime rate among 35 U.S. cities with a population over 500,000 from 2005 to 2007 -– all before construction on the fence began. And, according to the Uniform Crime Reports from the FBI, between 1993 and 2006 the number of violent crimes dropped by more than 34 percent. 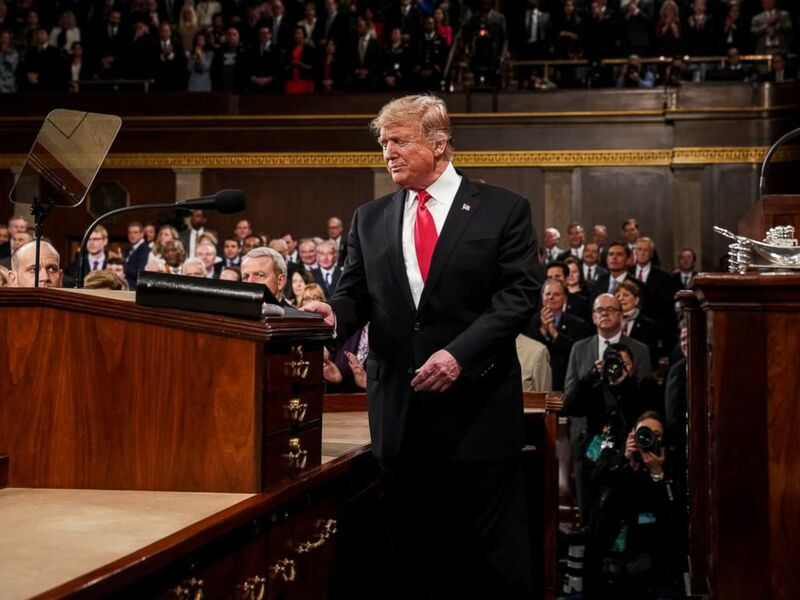 President Donald Trump arrives to deliver the State of the Union address in the U.S. Capitol Building on Feb. 5, 2019, in Washington. Still, Texas officials are divided on the impact of the border fence on crime. A month ahead of the State of the Union address, Texas Attorney General Ken Paxton was among other state leaders in McAllen, Texas, who participated in a roundtable on immigration and border security with Trump. "El Paso used to have one of highest crime rates in America," Paxton said on Jan. 10. "Since that fence went up, the crime rates in El Paso are now among the lowest in the country. So, we know it works." Campaign aides note this will be the seventh rally Trump has held in Texas, but the first in El Paso since his campaign launched in June 2015. The rally also comes just days before a congressional deadline of Friday midnight to make a deal on border security, as the country anxiously inches toward another government shutdown.